I knew it was going to rain this morning but I thought I might be able to fit in a run before the weather changed. As often happens on Saturday mornings, I got a little too comfortable settling in with a big cup of Green Mountain Double Black Diamond Extra Bold (thanks again Bill!) and watching the news. Time passed until I finally managed to tear myself from a hard hitting news story about dog racism and headed upstairs to change. My wife is extremely disciplined about getting things done and that includes her daily workout. When I got upstairs, she was already halfway through her treadmill run. Knowing that I'd planned to run outside, she looked at me sympathetically and said, "You're probably better off using the treadmill rather than running outside that this point." A look outside supported that view. I got caught in the rain about halfway through yesterday's run. Although it only lasted a couple of minutes, I found it extremely unpleasant. My run went fine. No heroics on the treadmill. I set a moderate pace and stayed with it throughout my targeted time. I got tired of switching the channel between the local news station, MSNBC, CNN and HLN every time they went to a commercial. I changed over to the Music Channels and was amused to see how the display ads differed depending on the type of music selected. 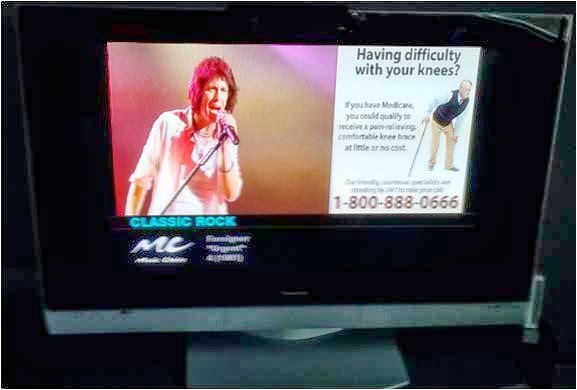 The Classic Rock and Soft Rock stations kept showing an ad with an older guy holding a cane, with the headline "Having Difficulty with your Knees?" Each time they showed that, I felt like yelling, "How dare you infer that I need your services just because I choose to listen to the Steve Miller Band! I'm running!" (actually I may have yelled it once). In the end, today's workout was exactly what I needed. I'd planned to throw in some fartleks, but SIOR made the point that I should not be focusing that much on speed at this point. Unlike some recent runs, today's felt energizing and I had no breathing issues or fatigue. Perhaps the warmer weather is helping. And not a moment too soon.